Mike Mulvey's side, who have offered a contract to former athletics star Usain Bolt, were denied all three points by a second-half equaliser from Roar debutant Adam Taggart. Tony Popovic's first match in charge of Perth Glory also ended 1-1, as Western Sydney Wanderers claimed a point at nib Stadium. Andy Keogh's strike capped the home side's first-half dominance, and Alex Grant's header looked destined to double the lead only to crash off the crossbar. 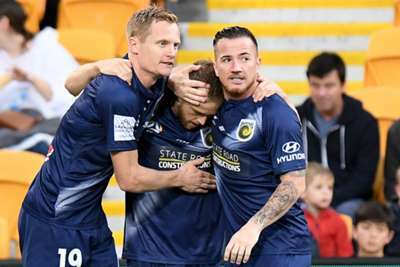 Wellington Phoenix joined Melbourne City as the only other side to win in the opening round of matches, after Mark Rudan's side beat Newcastle Jets 2-1. The 43-year-old's first A-League game in charge swung Phoenix's way 32 minutes in, when Daniel Georgievski's attempted clearance ended in his own net. Roy Krishna secured the win in the 89th minute after converting the rebound from his own missed penalty, with Dimitri Petratos' goal in the fifth minute of injury time serving only as a consolation.